I would love one down there. That would just add more people going downtown to enjoy life and spend money. It would be beautiful, and it will never happen. Not this topic again. It's been gone over and over so many times. How to tell sports stadiums don't lead to economic development? the image on the right. 42 years and the entire area is lacking for almost anything to do with going to an event. And the area around the stadiums would not be a hard area to find places to declare blighted. ^^ yeah, but looks likes it sandwiched between two highway trenches. Any residential there would be like camping in the middle of a divided highway. "The Greater Toronto Area is a commercial, distribution, financial and economic centre, being the third largest financial centre in North America. The region as a whole generates about a fifth of the GDP of Canada, and is home to 40% of Canada's business headquarters. The economies of the municipalities in Greater Toronto themselves are largely intertwined with one another. The work force is made up of approximately 2.9 million people and more than 100,000 companies The Greater Toronto Area currently produces nearly 20% of the entire nation's GDP with $323 Billion, and from 1992 to 2002, experienced an average GDP growth rate of 4.0% and a job creation rate of 2.4% (compared to the national average GDP growth rate of 3% and job creation rate of 1.6%). Currently, over 51% of the labour force in the Greater Toronto Area is employed in the service sector, with 19% in the manufacturing, 17% of the labour force employed in wholesale & retail trade, 8% of the labour force involved in transportation, communication &utilities, and 5% of the workforce is involved in construction. Despite the fact that the service industry makes up only 51% of Greater Toronto's workforce, over 72% of the region's GDP is generated by service industries. The largest industry in the Greater Toronto Area is the financial services in the province, accounting for an estimated 25% of the region's GDP. Notably, the five largest banks in Canada all have their operational headquarters located in Toronto's Financial District. Toronto is also where the headquarters of the Toronto Stock Exchange and the Standard and Poor TSX Composite Index are located, with offices of the TSX Venture Exchange also located in Toronto. The TMX Group, the owners and operators of TSX Exchanges as well as the Montreal Exchange are also headquartered in Toronto. The TSX and the TSX Venture Exchange represent 3,369 companies, including more than half of the world’s publicly traded mining companies. Markham also attracted the highest concentration of high tech companies in Canada, and because of it, has positioned itself as Canada's High-Tech Capital. The Greater Toronto Area is currently the second largest automotive centre in North America (after Detroit). Currently,[when?] General Motors, Ford and Chrysler run six assembly plants in the area, with Honda and Toyota having assembly plants just outside of the GTA. General Motors, Ford, Honda, KIA, Mazda, Suzuki, Nissan, Volkswagen, Toyota, Hyundai, Aston Martin, Jaguar, Land Rover, Subaru, Volvo, BMW, and Mitsubishi have chosen the Greater Toronto Area for their Canadian headquarters. Magna International, the world's most diversified car supplier, also has its headquarters located in Aurora. The entire automobile industry within the region accounts for roughly 10% of the region's GDP." beautyfromashes wrote: ^^ yeah, but looks likes it sandwiched between two highway trenches. Any residential there would be like camping in the middle of a divided highway. you can see the problem in gaining entertainment-centric development around any notable professional sports major stadium or arena in the region. The Legends and P&L have three between them. The Legends was sold by the city and P&L needs massive subsidies. the Cardinals associated minor league stadium and the city's project at that park is still mostly industrial, parking lots or empty fields. that's 9 stadiums or arenas that didn't lead to notable development around them. Probably worth noting that Legends is not at all an urban area, Springfield doesn't have a real "downtown" or enough people to make it significant, and Sprint Center does not have a major sports franchise. I think to compare the possibility of a downtown Royals stadium, you'd have to look to the most recent downtown stadiums in major metro areas that didn't already have a downtown stadium. Obviously, that is a huge metro area. While economic development is largely tied to other factors, the residential gains can be important to an urban area. Also, stadiums tend to come with significant infrastructure upgrades attached. Target Field led to Target Field Station, which has won a number of urban design awards. If you are spending $500 million on a new stadium, suddenly a $100 million streetcar or commuter rail extension are easier to sell. What about Omaha and TD ameritrade park, a lot of new retail and restaurants have gone up as a result of that new downtown stadium. Also, was Petco Park the main thing that kind of revitalized the GasLamp Quarter in SD? Open air or retractable roof? Omaha has warehouses across the street. Tulsa, the street view is a year old, but it has industrial on two sides. There's clearly exceptions but you can find stadium after stadium that didn't help a city right next to the stadium. And if people don't want to develop next to it, how can anyone claim the stadium drew the redevelopment? Remember, The Crossroads was an industrial district originally. Now it's well on it's way to not being one. Next to the Kauffman Center is going the same way. There used to be railroad lines down all the alleys west of Grand. only a single block behind Grand connects to the railroad anymore. So, as long as we're comparing neighborhoods around baseball stadiums, anyone notice the neighborhood around NYC's Citi Field? AllThingsKC wrote: So, as long as we're comparing neighborhoods around baseball stadiums, anyone notice the neighborhood around NYC's Citi Field? Are you referring to the proposed $3 billion redevelopment of one of the ugliest places in NYC that would never ever have been proposed without a stadium? I'm not sure whether you're being sarcastic, but that seems pretty dubious considering there was a different stadium in essentially the same spot for some 50ish years before that. I guess I just don't see how that area was going to organically grow beyond what it has become without some major influx of investment. Regardless of the past nearby development, I don't think it would be on the development radar at all without a stadium. NYC is a city with nothing but dense urban areas for developers to choose from. There are still a lot of options for investment like this, but the only reason it is being singled out, as far as I can tell, is because of the baseball stadium. Considering the parking lots to the north, west and south of the stadium it may be in an urban location but it is not dense. Then you have highways on three sides. You have a small area to the east and northeast of the stadium for development but given the looks at the area it might just have been one of those "urban areas for developers to choose from" with or without the stadium. Especially since the newer stadium has been open since 2009. Wow - that doesn't even look like anything I've ever seen in the US! kcjak wrote: Wow - that doesn't even look like anything I've ever seen in the US! Looks like NY to me! Go to 12th and Spruce, on the east side of Kansas City. Park your car and slowly walk the three blocks to 9th. 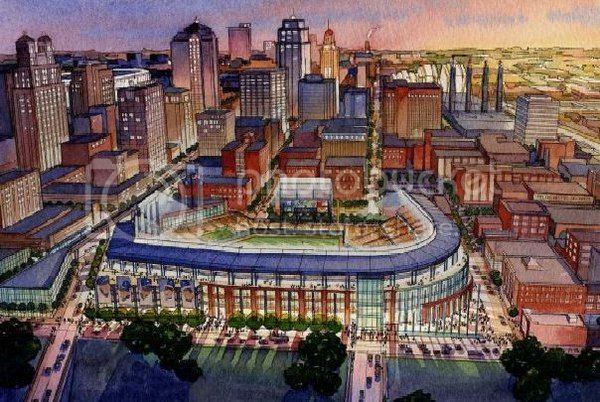 KCDowntowners tweeted (through Jared Miller) that Bill Dietrich, President & CEO, Downtown Council of Kansas City, says there will be a conversation about a downtown baseball stadium within the next five years.